Have you tried Home Chef? I am so glad I did! I’ll be honest, I was sort of taught to cook one way (southern home cooking) and when I got married I knew the basic meals – spaghetti, tuna casserole, chili, tacos… And over the last decade I’ve ventured up and learned how to cook a few new things too. But my menu to pull from is still pretty limited and gets a bit monotonous at times. It feels like we’re always eating the same thing all the time. Home Chef is the solution for that! They deliver perfectly boxed, pre-measured, fresh ingredients to your door with the step-by-step instructions for making the meal. And our first meal was something I never would have made on my own. 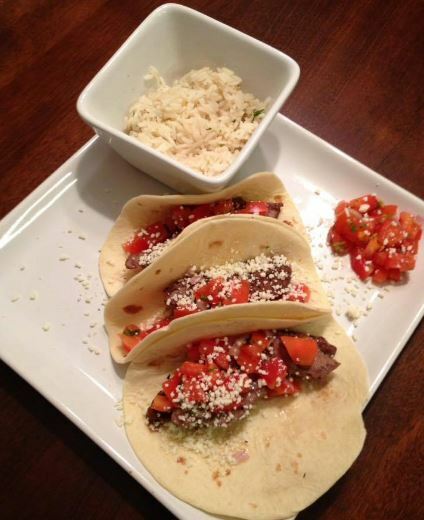 This is Home Chef’s Acapulco Steak Tacos with Pico de Gallo and Cilantro-Lime Rice. I made it, Home Chef made it easy! It was SO amazingly good! It was like something you’d get a restaurant! But it’s something I never would have tried on my own. If I had seen that recipe and had to go shopping for those ingredients myself I would have said, NOPE. And passed right over it. But now I know that I CAN make it! The recipe is in my Home Chef Binder (that comes with your first meal kit) so I can go back to it any time! Want to try Home Chef? I guarantee you’ll love it. AND save $30 off your first order through this link! Most meals are $9.95 per serving. So you can get one meal that serves 3 for free or you can get 3 meals that serve 1 for free! Or you can get two meals that serve 2 for about $10 after discount! 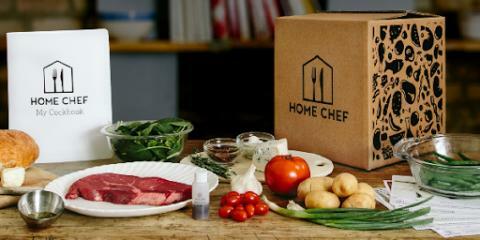 Home Chef is not an auto-subscription service either. You have to log in each week to choose your meals and place your order. So if you decide you don’t want more meals after using your credit, that’s it – you won’t have a recurring order show up at your door that you forgot to cancel! You should at least try it! With $30 to spend – what have you got to lose? They have an Acapulco Beef Burger this week that I’m eager to try after liking the Acapulco Steak Tacos so much! Next post: Jet.com Now Offers 2-Day Fresh Grocery Delivery | Save 15% off your first 3 orders!